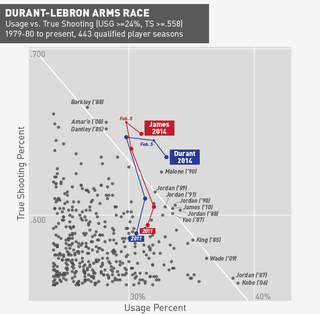 When we last took a look in February, LeBron James and Kevin Durant were both having monster seasons, with unprecedented combinations of offensive volume (usage percent) and efficiency (true shooting percent). There was still a lot of basektball left to play, but at the time we wrote that "if these stat lines hold, or if they even just regress a bit, 2013-14 could have not one, but two of the most remarkable offensive performances the league has ever seen." For James, career highs in FG% and TS%. For Durant, career highs in points per game, assists per game, and usage. Only one of these guys will get voted MVP—probably Durant—but both have given us seasons worth remembering.